The Blanket Tax Committee released a report on the Green Fund to the SA on Feb. 5 stating that it did not recommend the passage of the Green Fund, citing a lack of clear need, the possibility of setting a harmful precedent and a lack of research and preparation. Instead, it recommended a creation of a working group to research the possibility of other funding options. “We are not confident that the Green Fund is ready for creation and feel that its inception is too rushed,” the committee said. The proposal introduced at the Jan. 29 Senate would require both a senate and a campus-wide vote with a two-thirds majority to be implemented. Grace Wickerson, a contributor to the Green Fund, said the Green Fund tax would raise roughly $14,000 per year for sustainability initiatives including motion sensor lights across campus, rain gardens to retain runoff rainwater and sustainability updates to athletic facilities. Wickerson said the new Green Fund will be very similar to the 2010 Rice Endowment for Sustainable Energy Technology (RESET) program, save for a lower blanket tax charge than RESET’s $9 fee and an expanded focus from that of RESET, which focused primarily on decreasing carbon and water footprints. During its time as a blanket tax organization, RESET received the equivalent of $9 of funding per student, though unlike the Green Fund, the funds were taken from the blanket tax students already paid. RESET lost both its status as a blanket tax organization and its blanket tax funding after a three year trial period when students narrowly voted against the renewal of RESET in 2013. The SA voted to allow a re-vote on the issue in the spring election, but student turnout was too low to successfully renew RESET, according to SA meeting minutes from April 2013. The Blanket Tax committee’s report stated lack of a clear need for a program like the Green Fund as one of the reasons it did not recommend its passage. “It seems like a baseless tax increase for something nobody seems to really want except [Rice Environmental Society], which can’t give firm numbers on any projects,” Will Brown, a member of the committee, said during the Blanket Tax Committee meeting in which Kathy Yu, president of the Rice Environmental Society (RES) and co-sponsor of the Green Fund proposal, presented a pitch for the Green Fund. Like RESET, the Green Fund will partner with the Office of Sustainability, Housing and Dining and FE&P, according to Yu. Yu said she and Wickerson plan to talk with the administration about pursuing matching funds after the Green Fund initiative is placed on a campus-wide ballot. The Blanket Tax Committee, which rejected a proposal by RES to become a blanket tax organization in the fall, also expressed concern about the precedent the passage of the Green Fund would set. Wickerson said this entirely new system of funding is necessary to make the type of environmental initiatives envisioned by the Green Fund possible. 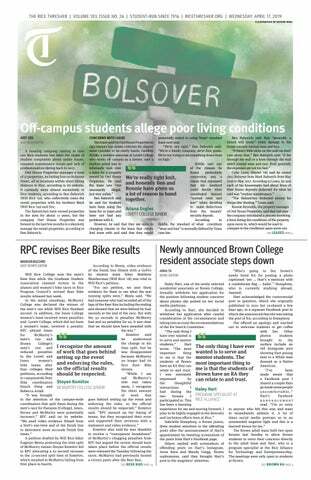 In its report, the Blanket Tax Committee said the fluctuation of the Green Fund’s budget from year to year makes the levying of a student fee unreasonable. The Green Fund would be overseen by a Green Fund Committee, which would be chaired by an official elected by a campus-wide vote, according to Yu. Initially, the creators of the fund proposal had planned for the committee chair to be elected by the SA Treasurer, but presented an amended plan at the Feb. 4 Senate following concerns over having a student-funded program led by an SA-selected official. During the SA meeting, Yu also presented an amended plan for surplus funds, which will now go into the Initiative Fund, following concerns raised by the Blanket Tax Committee the previous week over the lack of a plan in the case of surpluses. According to Lee, no environmentally focused clubs applied for Initiative Fund access in the fall. Wickerson said the structure of the Initiative Fund does not fit the Green Fund’s model. The SA vote on whether to place the Green Fund on the campus-wide election ballot will take place on Feb. 11. Disclaimer: Thresher Co-Editor-in-Chief Andrew Grottkau is a member of the Blanket Tax Committee.